Kings Highway (Rte 340) near Baily Rd., Coatesville, Chester County, PA The meeting was first set up in 1716 by Concord Monthly and an acre of ground for a meeting house and burial ground was purchased from John Mendenhall, at the edge of the "old Pim place at the foot of the hill". 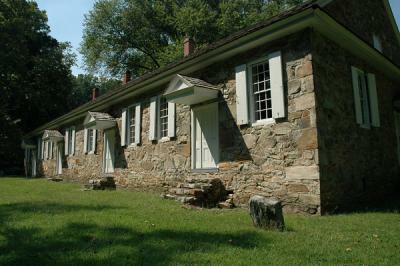 Meetings were held there until 1726, when 4 acres of land were purchased from Richard Pake and a three room stone structure erected, which is today known as "Old Caln" meetinghouse. In 1737 the meeting was transferred to the care of Bradford Monthly. The old meeting house was sold to William Pim in 1743 and the burial ground was deeded back to the meeting. After the Separation, the property was retained by the Hicksites though the meetinghouse was used jointly by both sides until the Orthodox branch built a meetinghouse of their own at Sixth and Chestnut in Coatesville. When Bradford Monthly was combined with Uwchlan Monthly, this meeting became part of the newly formed Bradford-Uwchlan Monthly meeting. In 1896, the meeting was discontinued and its members attached to Uwchlan Preparative. When Bradford-Uwchlan Monthly was laid down in 1900, the property was transferred to the care of Sadsbury Monthly. The meeting house is occasionally opened for special events. The Coatesville Particular meeting was established by the Orhtodox members of the Caln Preparative meetings after the Great Separation. Originally meeting in the homes of the members inthe Coatesville area, a gray stone meetinghosue was built at 6th and Chestnut in 1910. The meeting was laid down sometime after 1930 and the meetinghouse is now a private residence.